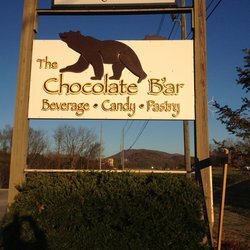 The Chocolate B’ar is a branch of The Lily Barn LLC (www.lilybarn.com ), one crazy woman’s dream to bring a higher standard of enjoyment to the Townsend area. We offer a large, inviting space to sit and read a book, search on the internet or just gossip with friends. Our stone fireplace is extremely cozy on the cold winter days and the leather couches provide a comfortable respite for relaxation. Maybe someone else will want to play cards, checkers, chess or backgammon or take a guitar or dance lesson. Since we open at 8:30, check with us for fresh pastries, quiches,muffins or a breakfast sandwich. We sell brownies, bar cookies, cakes ,truffles. We prefer to pack in baggies when possible for easy carrying and recylclability. Our trail mixes will give you a quick pick me up. Our homemade caramels and chocolate bark brings a smile to many faces. Latte Truffles cups , sea salted caramels and fudge are some of our original masterpieces. We offer a full listing of hot coffee drinks, cappuccino, lattes, espressos, americanos and of course, good old american coffee as well as frozen frappaccinos……our answer to Starbucks. As well as hot chocolate ! The proof is in the taste. But did we mention Smoothies? That’s right, Green Tea Smoothies, Mango Smoothie and Berry Smoothies that are meare displays of art in their purest forms, made with ice and yogurt. What better drink for the soul? Chocolate B’ar is a mecca for those who thirst…..not only for drinks and food, but we try to be an integral part of the community through music lessons, sponsorship of the Townsend Artisans Guild (www.townsendartisansguild.com ) and support of the Great Smoky Mountains Heritage Center (www.gsmhc.com ) We proudly support the Humane Society, the Hearts and Hands,the Kiwanis of Townsend and are members of the Townsend Business Association www.townsendvisitorscenter.com .